Experience the adventure of a lifetime and explore one of the most exclusive and well-protected travel destinations in the world. The majestic Buddhist country of Bhutan is known for its authenticity, vibrant people, rich cultural heritage and pristine natural environment. 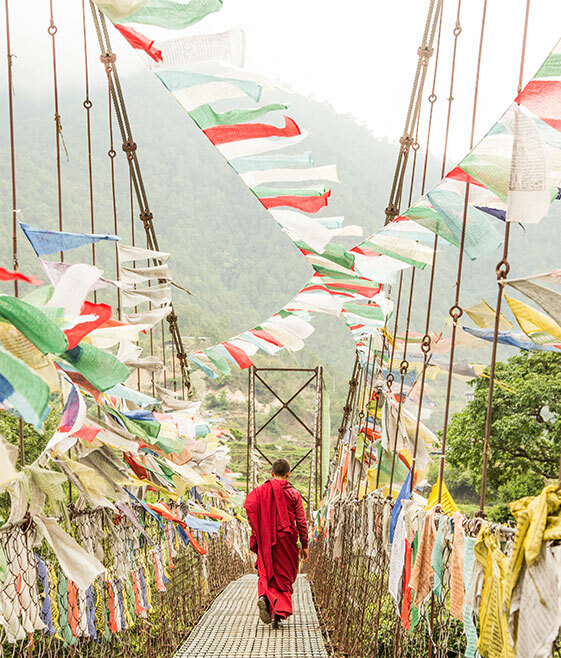 You will visit sacred temples and dzongs, explore the country’s majestic mountains, lakes and rivers, meet local dignitaries and friends of HANAH, wander villages, eat delicious traditional cuisine, learn about herbal medicines, and experience the inspiring Bhutanese culture, traditions and hospitality. The main event will be the Tour of the Dragon mountain bike race, a one-day 268 kilometer (166 mile) mountain bike race that starts in Bumthang town square on Saturday, September 7, and finishes in Bhutan’s capital, Thimphu. The cost of the trip includes: roundtrip airfare from Bangkok or Dehli to Paro, 8 nights at 4-star accommodations, professional drivers and local guides, visa and tourist fees, bike and luggage transport, three meals a day including curated dinners and special experiences, wellness experts, and HANAH herbal remedies. His Royal Highness Prince Jigyel Ugyen Wangchuck created the Tour of the Dragon mountain bike race in 2009. It is considered one of the most challenging one-day events in the world and will truly test your endurance, stamina and mental fortitude. The event is 268 kilometers (166 miles) long and rides over four Himalayan mountain passes before finishing in Thimphu town square. For those who are interested in a bike race of a shorter order, the event also puts on the Dragon’s Fury, a 60 kilometer (37 mile) event from Messina at an altitude of 1,410 m (4,625 ft), up to Dochula at 3,150 m (10,330 ft), then all downhill to Thimphu city square. Email us for more details about the Dragon’s Fury race itinerary. Both journeys take riders through the stunning rural countryside and villages of one of the most magical kingdoms on earth. Located in the eastern Himalayas, the country of Bhutan is a destination for adventure, nature, cultural exploration and spiritual growth. The Land of the Thunder Dragon is truly a majestic place—it’s a kingdom of magical herbs, sacred lakes and mountains, lost villages, deep mythology and cultural wonders. With 70% of the country covered in trees, it’s literally a carbon sink, and was recently named the first carbon negative country in the world. It’s also known for coining “Gross National Happiness” as a way to measure and guide the country’s prosperity and development, instead of GDP. In partnership with Bhutan Philanthropy Ventures, HANAH is honored to curate the Tour of the Dragon impact tour for a select group in September 2019. Come for the event, and stay for the travel experience of a lifetime. HANAH founder Joel Einhorn was first invited on behalf of HANAH to Bhutan in 2017 to share his knowledge of working in India with traditional medicines. He returned that September to ride his first Tour of the Dragon mountain bike race. Since then, he has returned with HANAH several times to work with the country’s Traditional Medicine Institute to bring their ancient herbal remedies to the U.S. for the first time, and to ride his second TOD. 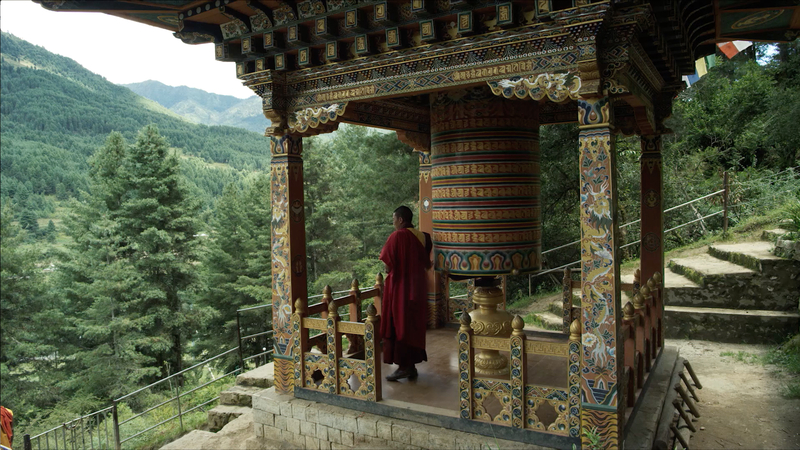 During Joel’s visits, he has forged lifelong friendships and embarked on an endless journey to explore the spirit and ancient wisdom that Bhutan holds. HANAH is honored and excited to share our discoveries and bring others along for the ride to uncover the magic of Bhutan for themselves. Visit hanahlife.com to learn more about our mission to preserve ancient traditions and adapt them into remedies for modern living. *subject to change based on weather, etc. Bhutan’s tourism industry is founded on the principle of sustainability, meaning tourism must be environmentally and ecologically friendly, socially and culturally acceptable and economically viable. 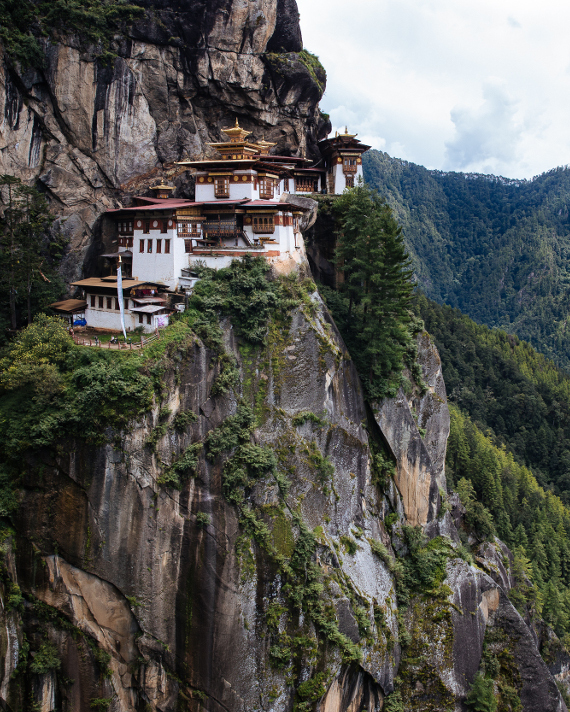 HANAH is honored to be a part of Bhutan’s policy of “high value, low impact” tourism. Here’s how you will support Bhutan by traveling with us. Portion of your $250/day tourist tariff (included in the trip cost) benefits the Tarayana Foundation, which was founded by Her Majesty The Queen Mother Ashi Dorji Wangmo Wangchuck in 2003. The Foundation works in remote, rural villages to bring about holistic community growth and development serving the needy communities. We stay at locally owned hotels and patron local restaurants and vendors to support the local community, economy and tourism industry. Read our FAQs below, or email us at ambassadors@hanahlife.com. Q: What is included in the trip cost? A: Eight nights at 4-star accommodations; round trip international airfare between Delhi or Bangkok and Paro, Bhutan; tourist visa; $250 per day tourist fee; airport transfers; professional driver for all excursions and day trips; private tours with local professional guides and cultural experts; sessions with traditional medicine experts; entrance fees; Tour of the Dragon race entry fee; bike and luggage transport; daily breakfasts, lunches and dinners; local tea with meals; departure airport transfer; HANAH herbal supplements. Q: What does the trip NOT include? A: Roundtrip airfare to Delhi or Bangkok; hotel accommodation in Delhi or Bangkok; travel insurance; hotel incidentals like laundry, bar tabs and spa treatments; optional activities like rafting; gifts and souvenirs; gratuities for local guides and drivers. Q: Where does the trip go in Bhutan? A: We will be traveling to the districts of Paro, Thimphu, Punakha, Phobjikha and Bumthang, with many stops along the way. Q: How does the flight to Bhutan work? 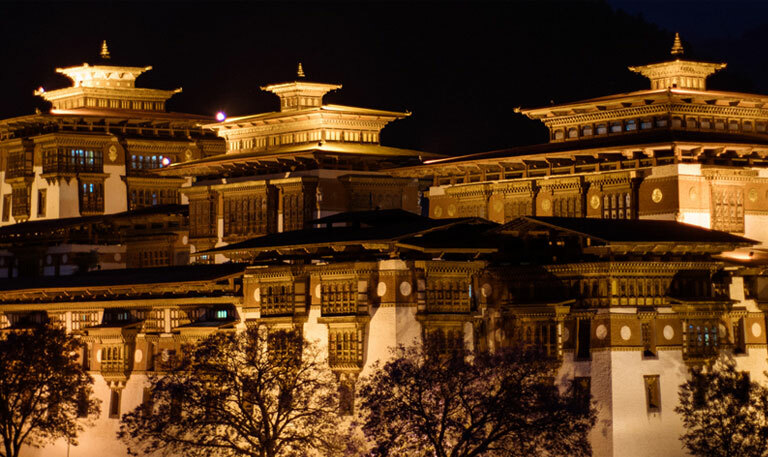 A: Your flight will be booked for you into Paro, Bhutan, by Bhutan Philanthropy Ventures. You can choose between Bangkok, Thailand (Suvarnabhumi Airport / BKK) or New Delhi, India (Indira Gandhi International Airport / DEL) for the roundtrip flight to/from Bhutan. You will only get your seat assignment when you check in at the ticket counter for your flight. You must have a printed copy of your visa and your ticket and your valid passport to board the flight into Bhutan. Q: When should I arrive/depart Delhi or Bangkok to catch the connecting flight to Paro, Bhutan? A: Your flight to Paro will be on September 2, 2019, from Delhi or Bangkok. Plan to arrive to Delhi or Bangkok by September 1, 2018 at the latest. Your flight will leave Paro on September 10, 2019. Book your departure from Delhi or Bangkok for September 11 or later. Q: What if I want to extend my Bhutan trip or arrive early? A: Please contact us with specific requests. Q: What if I don’t want to ride the Tour of the Dragon mountain bike race on September 7? A: No problem! Biking 268 km is optional and there will be many attendees not participating in the race on September 7. Q: If I am racing, do I need to bring my own bike? What kind of bike do you recommend? A: We highly recommend bringing your own bike to ride the race. It is a long and challenging course, and you will be better set up for success with your own equipment and gear that is fitted to you. Bikes and bike parts are limited in Bhutan. Please reach out of you have any questions. The TOD requirements dictate that you race with a mountain bike with at least 2-inch wide tires. We recommend a hardtail bike with some front suspension, but you will see people with full suspension mountain bikes. A fully rigid mountain bike is not recommended. Members of the HANAH team have used a Norco hardtail, a Santa Cruz Tallboy and a Specialized S Works hardtail. There are so many bike companies out there, but it is of paramount importance to be comfortable on the bike for 10+ hours. A bike fit is worth its weight in gold. A: Bhutan Philanthropy Ventures and their professional licensed tour guides will be guiding the trip. Q: Who is going on the trip? A: We can accommodate up to 80 riders for the Tour of the Dragon, and up to 100 travelers total. The group will be a mix of adventurers, nature lovers, and wellness and spiritual seekers. Q: What travel documents are required? A: All tourists (except Indian citizens) need a visa, which is included in the trip cost and will be secured by our local travel agency in Bhutan. You also need a passport with at least six months of validity remaining beyond the date of your arrival (which means it can’t expire before March 1, 2020), and enough pages for stamps. Q: What if I want my own room? A: Our pricing is based on double occupancy. If you want your own room, please send us an email for additional pricing and availability. A: Upon registration, we will provide a list of packing suggestions and more specific trip details about local culture and practices. For example, monastery visits require long pants/skirts and long sleeves. A: September in Bhutan is is generally clear and mild, with excellent scenery and lower rainfall. Prepare for a mix of temps depending on the altitude and time of day. The weather should be warm during the day, chilly in the evenings, with potential drizzles throughout. It can get very hot in the valleys (like Punakha) during the day. Here's a link that discusses this all more. We will be in Paro, Thimphu, Punakha, Phobjikha and Bumthang, with many stops along the way. A: Even though the altitude in Bhutan is higher than most are used to, altitude sickness is rare as most valleys are under 2,500 meters/8,000 feet. We will cross mountain passes that reach over 3,400 meters/11,200 feet. We do take it easy the first few days of arrival to allow people to adjust to the altitude. Q: When and where will we have access to wifi? A: You'll have access to wifi at just about all of the hotels we'll be staying in. Q: What vaccinations do I need? A: It is always good to make sure you are up to date on general vaccinations. Bhutan is clean and safe. But it’s a personal decision how you feel about getting vaccines when traveling. Visit the CDC website for more info. Q: What about drinking water? A: We will provide bottled water. If you want, bring a metal water bottle for travel teas, etc. Local Bhutanese drink the tap water and mountain run off, but they do not recommend it for visitors who are not acclimated to it. Q: Do I need to sign waivers of any kind prior to arriving in Bhutan? Q: Do I need travel/health insurance before I head out? A: It’s always good to have. You can buy it online, we use GeoBlue Travel Insurance. A: Bhutan Philanthropy Ventures will handle all refunds and cancellations. You may cancel up to 60 days prior to the scheduled departure date and receive a full refund, minus banking and other transaction fees. If you cancel less than 2 months in advance, there is a 100% cancellation fee..
Q: How much cash do I need? A: While some shops have begun to accept credit cards, most transact in cash only. The places that do accept cards charge a fee of 3-5% on top of your bill (your credit card company may also charge for a foreign transaction). The amount of spending cash is a personal preference, but we recommend having $500 for the trip to exchange into local currency upon arrival at the airport. Q: Where do I convert money to local currency and can I access an ATM? A: The national currency is the Ngultrum (“Nu” for short). The currency is pegged to the Indian rupee (the rupee can be used in Bhutan interchangeably in denominations under 500). ATMs and currency exchange desks are available at the airport and in parts of Bhutan such as Paro and Thimpu. Please note that some districts do not have ATMs. The banks in Bhutan publish daily rates at which you can exchange foreign currency for Nu at the bank branches. Q: Who handles my payment and when is it due? A: Bhutan Philanthropy Ventures (BPV) is the trip operator and will handle all payments. Payment must be made in full at least 45 days in advance of the departure date. 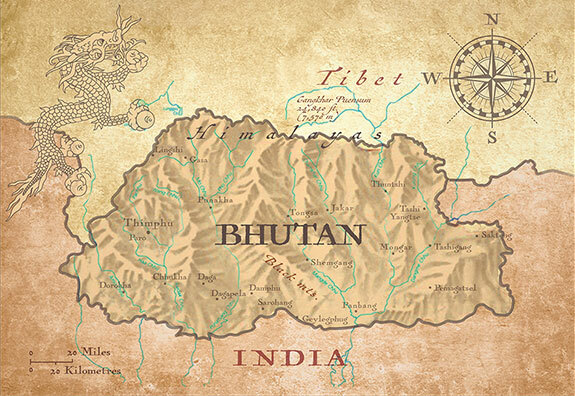 Once your package is paid for, BPV will secure your visa and flight to Bhutan. It can take up to one month to secure a Bhutanese visa and flights into Bhutan are limited, so it is important to plan your trip well in advance. .
We are sending you a receipt via email with more information about next steps. If you have not received it in 5 minutes, please check your spam folder. Something went wrong with the deposit or your email confirmation. Please contact us at ambassadors@hanahlife.com and let us know what happened. We will get right on fixing it.